On Nov. 1, the Career Center hosted guest speaker Jade Perry to elaborate on the “Unwritten Rules of the Workplace” as part of National Career Development Month. During her lecture at Kansas State, Perry delved into identity issues employees or job seekers may face when trying to navigate the professional cultures in their career paths. Perry emphasized the various kinds of capital, or wealth, that we all carry in the workplace. “It’s not just money; it’s different forms of accumulated wealth,” Perry said. According to Perry, there are many types of wealth that can be acquired and navigated with respect to time and place: cultural, linguistic, resistant, navigational, social, familial and aspirational capital. “There’s a particular form of wealth when it comes to teaching or learning how to navigate different systems,” Perry said. During the presentation, Perry was able to share stories about her own ways of using capital. Perry discussed a lot about how she uses resistant capital. Resistant capital is the way we critique or challenge the norms of the workplace. “My resistant capital happens mostly through my professional dress,” Perry said. Perry mentioned how her choice in style is influenced by many different things. “Some of my pieces are very much influenced by my sociocultural identity and my age,” Perry said. Perry also touched on how to navigate and research policies in the workplace that regard inclusion or exclusion. “You want to come to your interviews with good questions about policies and protocol,” Perry said. 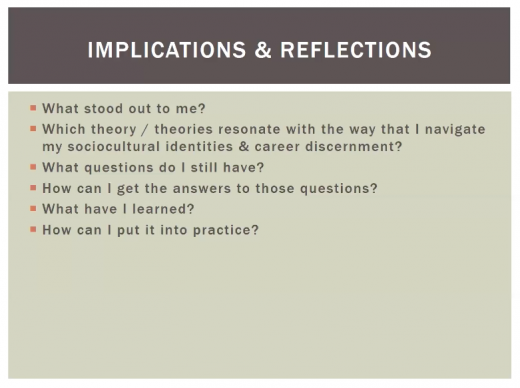 Asking these questions, according to Perry, is how you find out about the history of inclusion within a company. She mentioned that by doing research on a company’s website, news releases or social media may offer insight into their views on issues candidates may face. For Perry, navigating the workplace environment is important and not always simple. “The career discernment process is not easy,” Perry said. To see Perry’s presentation and reflect on her points, visit the Career Center’s YouTube channel. Perry has a master’s of education in college student affairs from Pennsylvania State University and regularly contributes to online platforms discussing a variety of topics. To learn more about Jade Perry or her theories on the work environment, visit Perry’s personal blog.